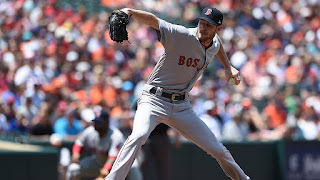 Andrew Benintendi slammed two home runs and drove in three runs to back six innings from starting pitcher Chris Sale as the Red Sox knocked off the Orioles 7-3 on Sunday afternoon at Camden Yards. The win game the Sox a split of the four-game series with Baltimore. Boston took a 2-0 lead in the top of the first inning when Mookie Betts and Benintendi scored on a Jackie Bradley Jr. single. Sale allowed three runs in the first inning on a two-RBI single by Chris Davis and a run-scoring double by Jonathan Schoop. Benintendi homered in the third to tie the game and again in the top of the seventh. He drove in another run with a single in the top of the ninth. Sale (pictured) went six innings in upping his record to 7-2; he has now won six games in a row. He allowed six hits and walked a batter while striking out nine. Xander Bogaerts had two hits and JBJ drove in two runs in the win. Matt Barnes came on in the ninth to close out the win. The win, coupled with a loss by the Yankees moved the Red Sox to within two games (three in the loss column) of New York. The two teams face each other in Yankee Stadium Tuesday, Wednesday and Thursday of this week.